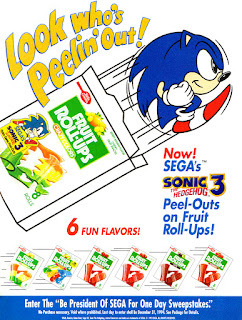 Sonic promoted a lot products in the '90s. Hi! This past week I added some images to the Facebook page. They are mostly the non-game ads I scanned while going through my gaming magazines. There are some game-related ads over there though if you want to check them out, like a Keebler ad with Sonic the Hedgehog and one for Zap Pax trading cards. Those ads will eventually find their way to Flickr but not until after I've posted all of the game ads. Right now I don't have a lot of interesting toy ads and haven't decided if I will put them on Facebook or at Flickr (or both). I had wanted to keep Flickr strictly for games but other items might not get in the way if I place them after the game albums. Flickr allows users to sort by collections as well, though I'm not sure if people notice the collections link as it's in the upper right on the albums page and not obvious. They really should place it in the link bar where photostream and albums appear. This morning I posted another set of ads and tomorrow I might get a G.I. Joe games post up. It's not exactly about the toys but I'll count it as my first toy post since the toys did exist before the cartoon and any other product so everything is mostly based on them. I currently don't have any other articles lined up as I continue to edit the game ads and go through some non-gaming magazines for other ads and the occasional game ad. Work and playing games takes up a lot of my free time as well, and with Mass Effect: Andromeda releasing in a few days it will probably become more challenging to make time for the blog but I'll definitely stay on schedule with the Saturday ad posts. A few days ago I added Google AdSense ads to the site. They shouldn't be obtrusive as I'm not placing them in or between the posts; there are two on the sidebar and one at the bottom of a page. I understand using ad blockers though I will appreciate it if you choose to disable the blocker on Vault 1541! I disable mine on sites I visit regularly, though I will admit that I have to block ads for a game site I like to read. Some of their ads cause my browser to freeze and crash so often that after six months or so it got too frustrating. Like I said, I don't think AdSense will interfere with the enjoyment of this site. The way AdSense works is it uses browser cookies to determine ads relevant to each user. You can manage your ad settings yourself here: www.google.com/settings/ads (you'll need a Google account for that). I did disable most of what Google classifies as sensitive ads (political, religious, dating, etc.) as I do want Vault 1541 to be a family friendly site and so that no embarrassing ads will pop up if you are viewing the site with a friend or child. As far as family friendly, one thing that is tough to avoid is mentioning M-rated games as I just did with Mass Effect. However, I won't ever use bad language or post excessively violent images. Also, since the site is about game ads I'm going to show many of those in posts and some of the game ads from the '90s do contain violence, models, and suggestive text. They did originally appear in general magazines so I wouldn't say any are too bad. There is one ad Sony created for Cardinal Syn that pushes the violence boundary and it's likely the worst one I've currently got so there's an early warning. I'll provide another when we get to Sony as that's a long ways off since I'm going alphabetically by publisher.